10 & 13mm (overlay) solid strip flooring that comes in width of 80mm. The hardness of the timber (Janka rating measures the hardness of timber. The bigger the rate, the harder to dent the timber). After installing the natural and standard grade timber flooring, the gums veins, knots, etc. will be filled with EPOXY resin filler. It is a clear fill that is as hard as the timber. After sanding and finishing makes the floor flat. The most common way to install parquetry flooring is to glue down parquetry pieces straight on concrete or on chipboard. As the parquetry pieces are small, they fit well with the subfloor. 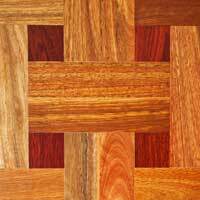 Parquetry flooring also comes in different grades � natural, standard and select. After sanding and finishing all you see a flat surface. Sanding. All sanding machines we use are latest technologies that give you a dust free environment. 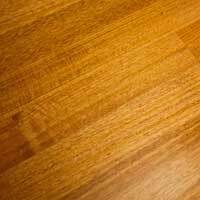 Our sanding is different than any other timber flooring company. We use a high quality sanding machine called WerkMaster Hardwood Floor Finishing Machine - three machines in one. It has patented Octi-Disc Technology that sands, edges, buffs and screens any wood surface to within 3 mm to wall. This machine gives you a 100% flat surface � no chatter marks, no waves. Coating. We are professionals in using all type of coatings. We can also suggest you to use the coating that fits your needs. Stain and liming. There is a wide range of colours to choose from that fits your interior needs. You can find some samples of stained timber at our showroom. Basically we can make your floor in whatever colour you want. You can bring the picture of the floor and we can match the colour. The best place to see the quality of our workmanship is to visit our Showroom 7 days a week.